I have a secret to share. 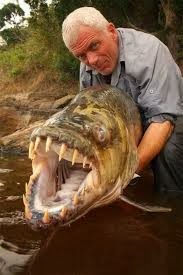 I actually love the TV show, River Monsters. For those who have never seen this program it's about a marine biologist, Jeremy Wade, who scouts places like the Amazon in search for underwater predators that could explain particularly gruesome legends; people mysteriously dragged into the waters and never seen again; boats tipped and limbs bitten off; creatures rising to attack. As with many cultures, monsters such as these become legendary and things to be feared, but at the end of the day explanations usually fall down to nature. And in the uncharted Amazon, who knows what lurks out there. I'm not really into fishing, and this program features a lot of that, but I just love discovering some of the fish that he comes across, fish that I'd never heard of - and fish that will fit so well in any fantasy world. Honestly, if you're world-building and have a river that you want to make dangerous, just give it life. Give it catfish big enough to swallow a human, piranhas that hunt in packs and can clean a bone in seconds, 200lb Tarpons with solid bone heads that leap feet into the air and have been known to tip boats and kill people with a single, unfortunate blow, and, of course, Tiger Fish, also known as the demon fish with its mouth full of razor sharp teeth. And not forgetting the smaller creatures that skulk around in the bottom and finish off what others don't eat. With the amount of flesh eating creatures in the Amazon it's no surprise that once someone goes in, you're lucky if you're ever found. So with that in mind, why struggle to think of ways to make your world ferocious and dangerous? Why always look to myth and legend to provide inspiration when all you have to do is look at the nature in our own world? It can hold answers you never even dreamt of. It's amazing how many different creatures exist on this world that most people have never seen. One good Google search can turn up all sorts of real life monstrosities. I've seen some of the monsters on that show. Creepy, scary, cool.